Your character’s background reveals where you came from, how you became an adventurer, and your place in the world. Your fighter might have been a courageous knight or a grizzled soldier. Your wizard could have been a sage or an artisan. 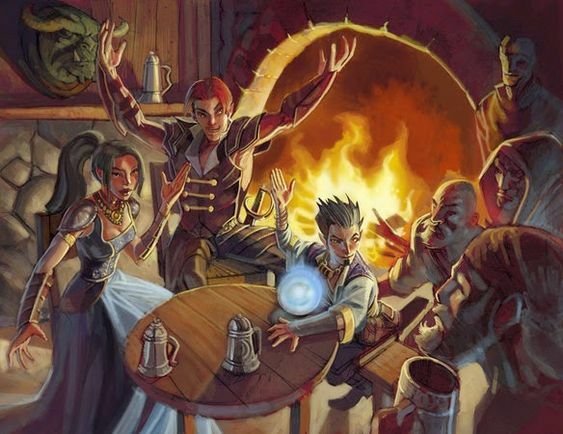 Your rogue might have gotten by as a guild thief or commanded audiences as a jester. Choosing a background provides you with important story cues about your character’s identity. What was his life like before you started playing him? How did he get his powers? What changed to make him put on a matching set of gloves and boots and take crime by the ears? Why didn't he just keep living his old life and keep his powers to himself? Who were the three most important people in his life? Where did he get the money to purchase his equipment and weapons? How did he learn his skill, tool, and language proficiencies? Where did he pick up his class features? The backgrounds in this section provide both mechanical benefits (features, proficiencies, and languages) and roleplaying suggestions. Each background gives a character proficiency in two skills (described in the Ability Scores section). Most backgrounds give a character proficiency with one or more tools (detailed in the Tools section). Some backgrounds also allow characters to learn additional languages beyond those given by race (detailed in the Languages section). If a character would gain the same proficiency from two different sources (such as Class and Background), he can choose a different proficiency of the same kind (skill, tool, or language) instead. Each background provides a package of starting equipment. If you use the optional rule from the Player's Handbook section to purchase gear, you do not receive the starting equipment from your background other than attire. A background contains suggested personal characteristics based on your life before beginning play. You can pick characteristics, roll dice to determine them randomly, or use the suggestions as inspiration for characteristics of your own creation. Personality traits are specifics about a character's demeanor. They might describe his beliefs, mannerisms, inclinations, habits, things they value or fear, and accomplishments. It's recommended that you define two traits for your character. Ideals are the strong beliefs of a character. They drive the character's actions and range from goals and worldviews to moral and ethical codes. They describe what a character desires and why and often go hand-in-hand with a character's alignment. It's recommended that you define one ideal for your character. A bond explains a character's connection to the world around them, be it through individuals, organizations, places, objects, or ideals. They are meant to give something for a character to care about as you begin play. Bonds can also be associated with other player characters to help create hooks and investments into the people in the team or story. It's recommended that you define one bond for your character. Flaws are negative personality traits. No one is perfect. Flaws describe fears, addictions, compulsions, or weaknesses. They might cause a character to go against their best interest or their best interest of the team, or that could be exploited by villains. Flaws don't ruin a character, they simply add realistic depth and the possibility for a nuanced story. It's recommended that you define one flaw for your character. You might want to tweak some of the features of a background so that it better fits your character or the setting. To customize a background, you can replace one feature with any other one, choose any two skills, and choose a total of two tool proficiencies or languages from the sample backgrounds. You can either use the equipment package from your background or spend money on gear as described in the equipment section. (If you spend money, you can’t also take the equipment package suggested for your class.) Finally, choose two personality traits, one ideal, one bond, and one flaw. If you can’t find a feature that matches your desired background, work with your GM to create one. The Player's Handbook offers a wide assortment of backgrounds to choose from, most perfectly suitable to Schön. Below are additional backgrounds specifically designed to connect you to this world. Way of the Wyrm. You're a member of the Draconic Order in Dargaul, a scholar specializing in magic and dragons.